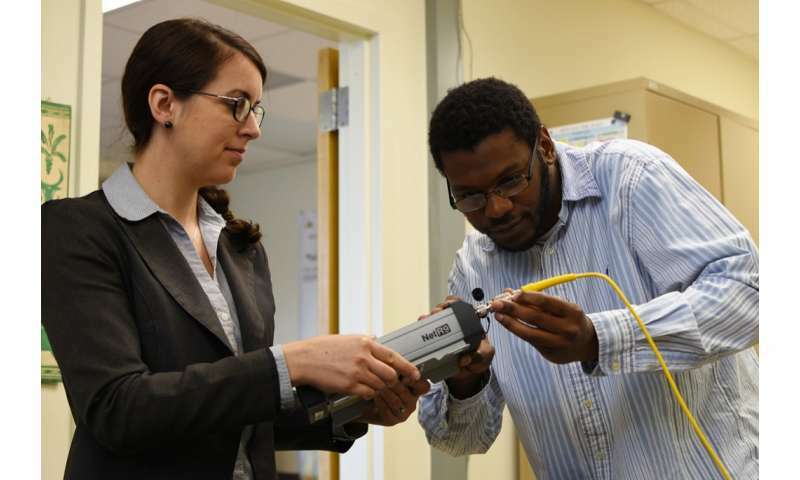 D. Sarah Stamps, assistant professor, and Josh Jones, a graduate student, both in the Virginia Tech Department of Geosciences' Geodesy and Tectonophysics Laboratory, pre-test GPS sensor equipment that will be placed around Tanzania's Ol Doinyo Lengai volcano. The equipment will help predict and monitor movements of the volcano, as well as possible tectonic motions along the Natron fault near the volcano. Tanzania's Ol Doinyo Lengai is unique for two reasons: It's the only active volcano that erupts natroncarbonatite lava, and it's within a region where the Earth's surface is just beginning to rift apart. This month, Assistant Professor D. Sarah Stamps of the Virginia Tech Department of Geosciences is launching an observatory there to track activity of both the volcano and the continental rift. The journey, taking place from June 2 to June 30, brings Stamps and graduate student Josh Jones to a remote village in the Arusha Region, Tanzania. There, Stamps, who has been to the area several times, and Jones—this trip will be his first to Africa—along with researchers from the region and Korea, will place five high-precision GPS sensors around the volcano. The sensors will have the capability to send data in near-real-time from the volcano to Stamps upon her return to Blacksburg. The volcano is known as the "Mountain of God" in the local Maasai language. Stamps has been to the volcano many times, first traveling to the region in 2006 as an undergraduate in earth sciences while at the University of Memphis, Tennessee, and again as a doctoral student at Purdue University. In 2008, she witnessed the volcano erupt. 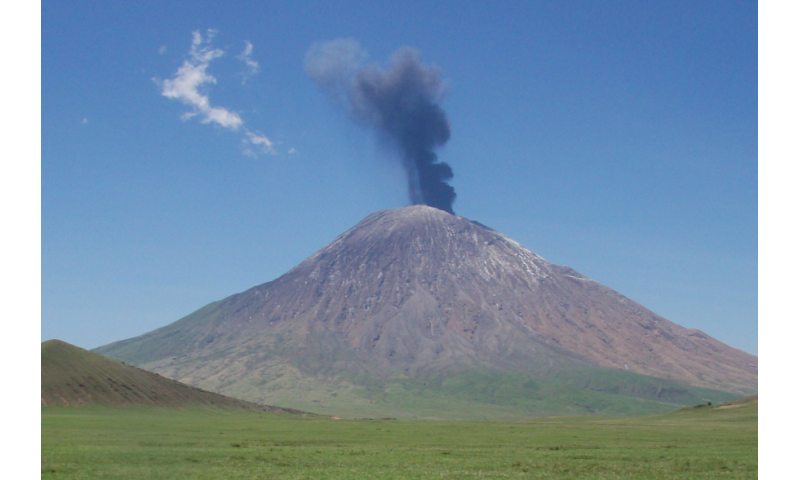 Stamps is a leading expert on the tectonics of the East African Rift System, in which Ol Doinyo Lengai volcano resides. The June trip with Jones will further Stamps' knowledge of the area, and provide other experts and locals with a better warning system of volcanic activity and tectonic movement along a nearby fault. The relationship between the two— does volcanic activity lead to plate movement or the opposite, or neither—is a key component of Stamps' work. Additional trips to Tanzania will follow in this multiyear project. "Our goal is to advance scientific knowledge in the field of plate tectonics," said Stamps. "We will understand, for the first time, the link between present-day volcanism and the long-term tectonic development of continental rifts. To do so, we are employing state-of-the-art sensors and cybertools that allow us to monitor deformation of the volcano and fault movement along the Natron fault in real-time." Among the tools in Stamps' employ is CHORDS – that's short for Cloud Hosting for Real-time Data in the geoSciences – developed through EarthCube, the National Science Foundation (NSF) cyberinfrastructure program. The NSF has funded many of Stamps' trips to Tanzania, including a portion of this trek. to serve as a local base. Their work will provide locals with the open access to the internet for the first time. Language barriers have abounded in previous research efforts, with English-speaking researchers working with Swahili translators, who then translate requests, questions, and the like into the local Maasai language, and back again. "Many petrologists and geochemists have studied the volcano, but no one has developed a volcano observatory at Ol Doinyo Lengai," added Stamps. "The lack of a volcano observatory is due to the remoteness and challenges of working in a developing region. There is no electricity in the area and all access to the region is limited to unpaved roads. We are bringing open access to the area for the first time. There is closed-access internet restricted to tourists and employees of the Tanzania Tourism Board." Stamps' previous research trips to Tanzania also involved sensors and GPS markers, but real-time data collection was not an option. "Real-time data transmission and visualization of GPS data is truly at the cutting-edge of technology," said Stamps. "The capacity to do this has only been developed in the last year—really just in the past few months." Her goal is to make monitoring data from Ol Doinyo Lengai as effective as tracking information from the Yellowstone Volcano observatory in Wyoming. The research project at Ol Doinyo Lengai is truly international, with Stamps working with Tanzania's Ardhi University and the Korea Institute for Geosciences and Mineral Resources. Jones, of Yorktown, Virginia, who earned his bachelor's degree in geosciences from Virginia Tech in 2015, called the research trip a dream of a lifetime. "I am very excited about exploring and studying the only active carbonatite volcano in the world," he said. "I have always been drawn to the beauty and awe of volcanoes throughout my time as an undergraduate at Virginia Tech. The chance to climb and study an active volcano is a dream come true. Hopefully, I will be able to explore more of the volcano than just what our research requires and, if at all possible, reach the summit." The natroncarbonatite lava rock that is produced by Ol Doinyo Lengai may be familiar to Virginia Tech. It is the compositional equivalent of Hokie Stone. While not an exact match to limestone, its coloring is near identical when cooled. Older carbonatite volcanoes, such as Homa Mountain are nearby, but extinct. The nearby fault is young for Earth, roughly 5 million to 10 million years old, whereas other rifts in Africa date back 25 million years and older. "This volcano is the best place on Earth to study how volcanism influences continental rifting in its early phases of development," said Stamps of her work. Research efforts for Stamps and Jones reach out far beyond tectonics. With high-precision global navigation satellite systems and sensors that can detect earth movement with millimeter precision, both researchers will be using computational modeling and big-data mathematics to study seismic activities.